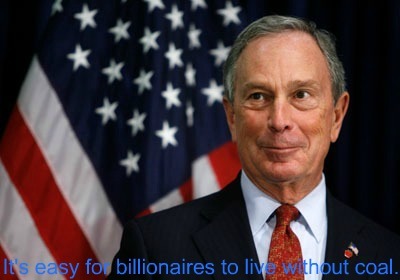 Michael Bloomberg, Mayor of New York City and billionaire founder of the Bloomberg financial news service, has announced that he is giving $50 million to the Sierra Club for their Beyond Coal campaign. The gift over four years from Bloomberg’s charitable foundation will allow the Sierra Club to double their Beyond Coal staff to 200 and expand their efforts from 15 to 45 States. The Sierra Club takes credit for stopping 153 new coal-fired power plants. Now, they will be able to campaign to shut down existing plants. Apparently, Mayor Bloomberg is happy to make billions of dollars supplying financial news to business and industry, but doesn’t care about restoring economic growth or about out-of-work people struggling to pay their electric bills and keep the lights on. Previous post: Are New Environmental Laws and Regulations Worth the Gamble?